Rigoberta Menchú Tum holds up the Alice & Clifford Spendlove Prize for Social Justice, Diplomacy and Tolerance. Nobel Peace Prize winner Rigoberta Menchú Tum was honored Monday as the 12th distinguished recipient of the Alice and Clifford Spendlove Prize in Social Justice, Diplomacy and Tolerance at the Art Kamangar Center at Merced Theater in downtown Merced. Menchú Tum discussed her life in front of a full house at the theater, highlighting her continued battle for social justice in her home country of Guatemala. Menchú Tum signed copies of her autobiography “Crossing Borders” at the end of the event. She spent two days in Merced, making time to offer inspirational words to a group of Planada fifth-graders and a group of UC Merced students before returning home. Menchú Tum was awarded the 1992 Peace Prize for her work as an organizer of efforts to resist oppression in Guatemala and advocate for indigenous people’s rights. Death threats have forced her to live in exile in Mexico for many years. UC Merced Professor and John D. and Catherine T. MacArthur Chair Arturo Arias introduced Menchú Tum, sharing how he first met her in Mexico more than three decades ago. Arias was part of a delegation of university and community leaders that welcomed Menchú Tum to Merced and to the campus. On Tuesday, 70 fifth-grade students from Planada Elementary spent time with Menchú Tum as she discussed the importance of finding inspiration. “One of the things that inspires me is the sun because it lights our way and I use it as a motivation for strength,” Menchú Tum said. Menchú Tum discussed her childhood in Guatemala and the hardships of seeing her father murdered and having her mother disappear. Menchú Tum said her mother’s body has not been found. 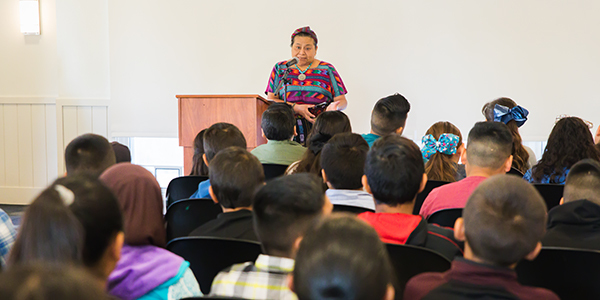 Rigoberta Menchú Tum speaks with fifth graders from Planada Elementary about what inspires her. Students were able to ask Menchú Tum questions and she closed the session by discussing how she has a personal mission and completing the mission requires taking action. Menchú Tum also met with more than 100 UC Merced students, encouraging them to be curious and constantly search for truth. The Alice and Clifford Spendlove Prize in Social Justice, Diplomacy and Tolerance is awarded annually to a leader, scholar, author, artist or citizen who exemplifies courage in the face of injustices and whose actions make a positive difference in the lives of others. Campus supporter Sherrie Spendlove established the gift in her parents’ honor in 2005 to commemorate their work in education and social justice. Past recipients include President Jimmy Carter, Native American activist and author Winona LaDuke and Professor Anita Hill, attorney and professor of social policy, law and women's studies.